The Hippy Chick Dress. Finally. 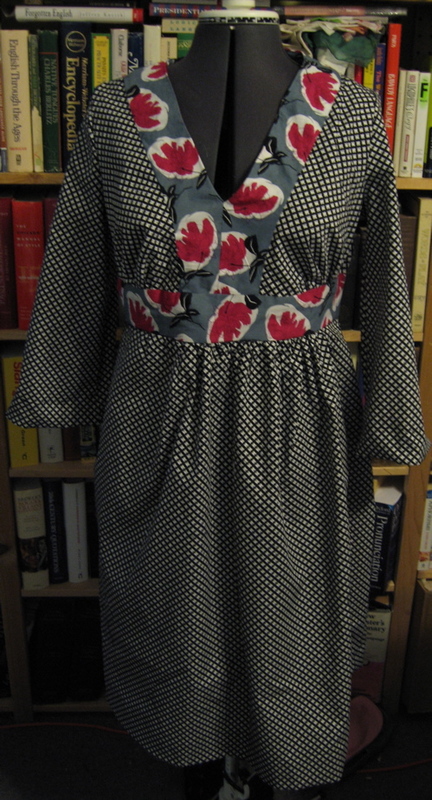 I finally finished the damn thing — the Hotpatterns dress, that is. I'm planning on doing a write-up of the pattern on PatternReview, because, my god, the instructions made NO sense. I finally gave up trying to follow them and just put the dress together the way that seemed logical to me. (They were also misspelled. $20 for a pattern should buy me at least spell-check!) So if you are a beginning sewer and haven't put in several dozen flat sleeves or can't pull gathering in your sleep, don't try this at home. The pieces fit together great, though, so once you figure out the order, it does go pretty well. I only had to "sew with the iron" (that is, press the hell out of pieces to make them join up well) once or twice, and those were probably my errors, not those of the pattern. I really think this pattern would work best with lightweight fabric that has at least a little stretch, which is what I will try next time, even though I found three other Liberty scraps that are dying to be put into service! I guess I could always make the main body in stretch and keep the yoke and waistband Liberty. I'm a little unhappy with the neck–I have to look up that article in Threads about what to do with gappy v-necks; you can see in the picture that it doesn't lie as flat as I would like. And the midriff band is not completely even. But hey, it's done, it fits, I really need to find a heavy jet bead choker to go with it, and I'm wearing it tomorrow. And I'm sure that this will be construed in some jurisdictions as "permission to stalk", but if you happen to be in New York (where I will be on Tuesday–not for anything to do with Fashion Week, I hasten to add), and you see this dress on some random person, feel free to say "Hey, aren't you A Dress A Day?" Whereupon I will blush like a rouged radish and stammer a confused affirmative. Beautiful dress. I love the Liberty print. I will be traveling to NY in March with my mother and one of the things I really want to do is hit some great fabric stores. Would you mind recommending a few? One of the tricks is to sew transparent elastic on the underside of the gappy bit. Beats unpicking the whole frelling thing! Hmm. I love both prints, but I think all that gathery stuff would make me look very bulky. Which is why you made the dress for you, and not for me, I’m sure. But yes, I agree that something with a little stretch would probably be great for the next iteration. You think it requires stretch? I’m thinking it needs lots of drape — challist might be good.Hmm. I have this stretch of Liberty challis that got moth-eaten (sob!). It might be perfect for this. Okay, I think I fixed the problem. The pictures weren’t showing up in Internet Explorer because it doesn’t like blank width and height values.Y’all KNOW you should be using Firefox, right? Right?Bbbrug, there’s a version of the dress with a non-gathery skirt, too. Thanks Jonquil for reminding me of the elastic trick! And yes, you should give your Liberty challis a new chance at life …Fabric store reqs coming soon! Props for your shout out from the Manolo!S. Have had a rummage on the Hot Patterns store and though some of the ideas are fine, I think you got the best one – overpriced and a bit “highstreet” for my taste. Vintage patterns are just so much better value and so much more stylish, to refer to yesterday’s post…Congrats on the combination of fabrics, too, very satisfying, and they look v crisp – GORGEOUS!! congratulations on a great dress… i really love it. terribly envious of your sewing machine abilities – i’ve had one too many furious tantrums of frustration at my crappy old machine. sworn not to attempt another project until it is replaced. I’ll look for you around NY wearing that pretty thing! Jonquil is right about the wonderfulness of clear elastic. I used it to rescue a polarfleece dress which gave passersby far too much to see, and I often use it where patterns would normally have me put in stay tape. 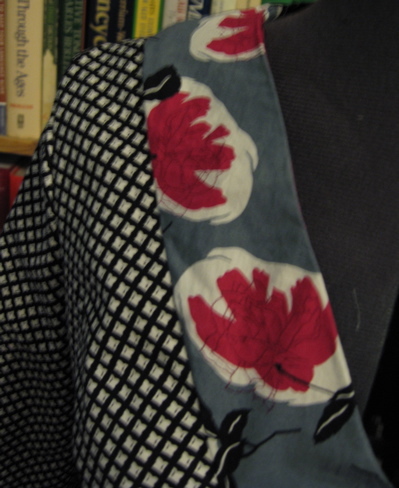 For instance, I’ll put it in the shoulders of a top or dress (woven), so that it has some movement, but will return to shape, or I’ll use it in the shoulder of a knit, to keep it from bagging out. Good for you and thanks for posting one of your own creations! You might find that a clapper will help on the pressing of fiddly bits. (My clapper is just the block part. I dont have the point presser attached to it.) I am so waiting until I use up my ugly fabric so I can go buy some pretty stuff like you have and make myself a dress for Spring! Thanks for the continuing inspiration. ps: this might be way off… but let me know if you’re ever interested in trading some dress-making for some knitwear. Anna, thanks so much for the offer! I’m afraid I never really have time to do dressmaking for other folks — and even when I did have time, it always ended in tears.